The aim of this (short) document is to explain how to propose a dataset and evaluation modalities to OAEI. Since 2010, these rules have been made more precise. Hereby, organiser denotes a group of person willing to propose a data set to evaluate or an experiment in a particular OAEI campain. 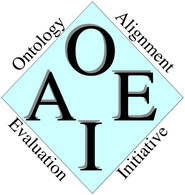 OAEI denotes the people coordinating the OAEI campaigns including its steering committee. In practice, OAEI is the set of all organisers of a particular campaign (so, may be you). Potential list of participating system with indication of their asserted willingness to participate if they have been contacted (this can also be "all usual participants of OAEI"). all this information, would be preferrably put available somewhere on the web (most of this information follows the template). In principle, this should be sent at the beginning of the year (between January and March, the earlier the best). Set up a web page/site exposing the data set and explaining the rules to participate. This web page should follow the template provided by the organisers. Evaluate the participant results in due time and providing them with feedback. Providing the final results in due times as (1) a web page/site, (2) a section in the OAEI summary paper. Both web pages/sites will be relocated within the OAEI web site at the end of the campaign. They should be maintained until then. Alternatively, it is possible to ask OAEI to maintain the data track web page/site but this would be at the expense of responsiveness and at the discretion of the web site maintainer. Bug you in order to get everybody satisfied. Any track which has less than two participants independent from the organisers will be declared fruitless. It is not forbidden that a system participates in a track that its promoters have organised. However, fairness would require that such systems participate at least in two other tracks.